have a flattened area on their forehead, opposite the flattened area at the back. If your Plunket nurse believes that the flattened area is linked with early closure of fontanelles (soft spots on a baby's head), talk to your doctor for further advice. Sleeping on their back without varying their head position. Having too little tummy time when they're awake (tummy time is when they're placed on their tummy). Spending a lot of time in car seats, bouncinettes and prams, especially if the baby sleeps in this equipment. Lying in one position in the womb for a long time. This is most likely if they're cramped for space, especially with twins, triplets, and so on. Flattened areas are often associated with torticollis. Torticollis is when the baby can't move their head much in one direction and prefers to turn it to one side. Flattened areas and torticollis can also happen independently. If your baby has flattened areas, follow the recommendations below. If it continues, talk to your doctor about seeing a physiotherapist. These recommendations can treat flattened areas on a baby's head as well as prevent them. When your baby is asleep, turn their head to one side and alternate sides for each sleep time. If a flattened area has developed, turn their head away from the flattened area and onto the more rounded side every sleep time. 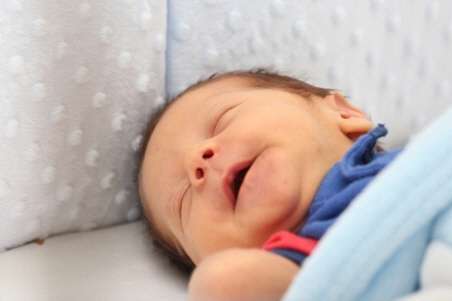 Encourage your baby to turn their head both ways while lying in their cot. Your baby may turn their head towards points of interest (such as doorways, windows or toys). If this happens, you may need to change the end of the cot the baby sleeps at or turn the cot around. Always supervise your baby when they're having floor time. When your baby is awake, place them on their back with a rolled-up towel under their preferred side. Put their toys on their non-preferred side. This will help to keep the pressure off the flattened area. Sit or lie on the floor next to your baby, alternating the side you're on, or staying on their non-preferred side if they have one. When your baby is lying on the floor, place them in the room so they're looking towards the light or where the action is. Place your baby on their side, with a rolled-up towel behind them to keep them in position. This helps to keep their neck in a neutral position and keeps the weight off the back of their head. Place your baby on a firm surface allowing free breathing. You can do tummy time in a variety of ways, for example on a parent's chest, over a wedge, over a cushion, over a rolled-up towel, or over an adult's legs. Put toys on both sides of their face to encourage them to turn their head (or just on the opposite side to the flattened area if there is one). Interact with your baby from both sides (or just on the opposite side to the flattened area if there is one). Start with just a minute or two and gradually increase to as much time as your baby can manage. Limit the time in car seats, prams, strollers and so on. Take your baby out of the equipment when it isn't needed. Don't use Jolly Jumpers and ExerSaucers as positioning devices, especially for young babies. Time on the floor is much more important for developing movement skills and strength. If you have tried the above advice and your baby's head isn't getting better, or if you're worried, contact your GP. How to prevent you baby getting a flat head, and what to do if they develop one. Information about craniofacial conditions and treatment. Written by Child Development Service, Montreal House, Canterbury District Health Board. Adapted by HealthInfo clinical advisers. Endorsed by clinical director, Paediatric Surgery, Canterbury DHB. Last reviewed April 2018. Images courtesy of FreeDigitalPhotos.net. Newborn smiling in his dream by David Castillo Dominici. Laughing baby by Clare Bloomfield.